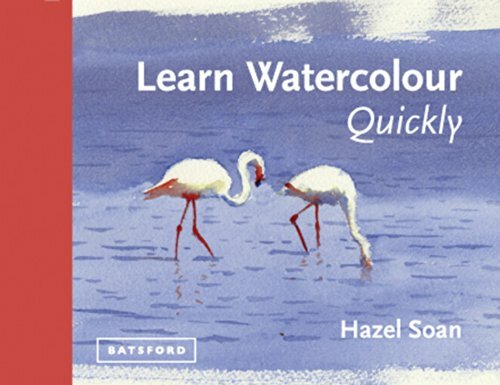 I'm a fan of Hazel Soan's watercolour paintings which is why I decided to check out her latest book Learn Watercolour Quickly. I got off to a bad start at the introduction where it says that you can read this book in about 30 minutes. That should give you an idea about how much text and information there are in this 112-page A5-sized hardcover. This book is actually a very condensed introductory guide that explains what watercolour is. Every topic or technique is just given a one paragraph treatment. Then there's either one or two pictures of some effects (e.g. splatter, wet on wet), followed by a finished painted example. The steps towards creating the final painting is missing. The information is useful, yes, but they are too short and lacking in depth. I feel that beginners will find it more helpful if there were more hands-on tutorials — there are only two extremely brief step-by-step demonstrations. At the end of the book, I suppose you'll know the theory of the various techniques but most likely you won't know how to use them well in practice, or in combination to finish a simple painting. Yes, I think you can learn some basic watercolour techniques quickly, but definitely not with this book. To learn watercolour so quickly might end up frustrating you instead. For 30 minutes, that's just enough time to learn one of the many techniques. Learn Watercolour Quickly is an introductory guide that could be better with techniques more elaborately demonstrated.